Symposion. A Journal of Russian Thought. The new annual Symposion. A Journal of Russian Thought announces a call for papers devoted to the past, present and future of Russian philosophy and its interactions with Western and Eastern intellectual traditions. Articles up to 25 pp. and reviews up to 5 pp., in English, to be submitted as computer files (Macintosh compatible) and 3 hard copies. The first issue came out in November 1996. Subscriptions are available from Charles Schlacks, Jr., Publisher, University of Southern California, The Center for Multiethnic and Transnational Studies, 344 Salvatori Hall, Los Angeles, CA 90089-1694. The subscription price is $15.00 for individuals and $20.00 for institutions; an additional charge of $2.00 for domestic and $2.50 for foreign postage. Surveying the landscape of thought in our day leads one to hope and despair. If the nineteenth century was an age of optimism, and the twentieth an age of pessimism, then we now experience a time both optimistic and pessimistic, a time in which ambivalence stands shoulder to shoulder with ambiguity. As we look ahead, we increasingly look back; we try to reflect on the past, but, no matter how we might want to, we are unable to restore what is lost. This new dualism is reflected in the study of Russian thought in the West. The analysis of Russian thinkers and ideas is usually profoundly historical, a past-tense narrative about what is felt to be fully and irrevocably past. Attempts to point to the relevance or vitality of Russian thought commonly remain within the Western conception of relevance. Like the Conquistadors extracting Inca gold from the temple of the Sun King, we seem to have nothing to learn from Solovyov, Florensky, Bakhtin, except what we were already accustomed to. There is little willingness or ability to rise above oneÕs immediate context; we all suffer deeply from what Dostoevsky called Ôthe worship of the fact,Õ demanding that our world be accepted as it is, without questioning whether it might profit from becoming something different. Yet one fundamental feature of Russian thought is its openness towards the future, its striving to reveal hermeneutic or ontological levels of a shared reality capable of sustaining substantive dialogue between different people concerning the basic questions. To a large degree, it is for us to seek an effective meeting with Russian thought, for us to accept its invitation to listen and hear to new word, however strange it might seem at times. A symposion is the perfect venue for such a meeting: here various people gather around a single table with the common goal of intellectual and spiritual communion. Of those who have gathered around this imagined table, some are Russians seeking to understand the West in their own terms, some are Westerners seeking to understand Russia. Here we all meet and discuss these issues in our own way, but with open ears and minds. The only condition for participation is the putting-aside of all preconceptions regarding what is past and what is yet to come: here we must only be open to the intellectual current that has begun to flow between East and West. Symposion is table-talk. The issue before you contains a mix of works united by their orientation towards Russia and their openness to the future, and to that which, though past, remains to be understood. 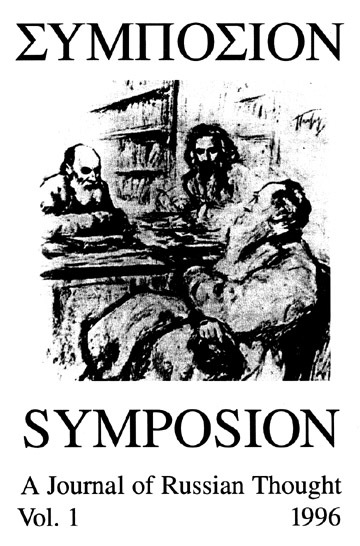 We open with a couple considerations of the concept of the symposion, by Andrei Shishkin and Mikhail Epstein. Then, Alexei Chernyakov and Mikhail Epstein examine how Russia is currently seeking to resume its philosophical calling in the post-modern age. Igor Vishnevetsky explores a post-modern aspect of the quintessentially modern writer, Andrei Bely, while testing the limits of literary hermeneutics. The documentary section of our journal presents one past encounter between Russian thought and America Ñ that which occured between the YMCA and Sergius Bulgakov, Ñ and facilitates the future encounter between the anglophonic world and Aleksei Losev, the last of the Russian Mohicans. Finally, the review section presents a view how Russian thought is being studied and understood in the West. We hope that this symposion will become one more landmark on the way towards a common understanding and comprehensive communion. In this connection, the editors have two requests for those who have resolved to leaf through its pages. We ask that the reader participate with open mind and heart, and then he or she then consider contributing to the continuance of these annual Symposia. The linked materials are presented here in electronic form. Alexei Chernyakov "The Consolation of Philosophy Today"
Ilya K. Mengden, "Clay Spirited"
Mikhail Epstein. "On the Stature of Things in Russian Thought"
Anesa Miller-Pogacar, "Introduction to a Lyrical Archive: Object and Text in the Suspension of Emotion"
Evert van der Zweerde, "Soviet Scholasticism Revisited"
Vladimir Marchenkov, "The Orphic Theme in Viacheslav Ivanov"
Alexei Gibson, "Towards a History of the Russian Catholics"